Notes: This package includes a DVD an Ultraviolet copies of the film. It’s rare for films produced in this day and age to feature such a simple idea with such an overwhelmingly cinematic vision. A Quiet Place is a film told only with images and sound with only the occasional exception. There is very little dialogue. It was not only unnecessary to tell the story via an endless stream of expository dialogue, it was essential to the film’s story that they didn’t. Other filmmakers could learn a thing or two from the success of this film and make more of an effort to tell their stories without resulting to tired and downright lazy dialogue to tell the audience the things that they need to know (especially since so many screenwriters aren’t very good at this). Those wanting to write and direct movies should at the very least know how to tell a story visually. It’s fundamental to the medium—so much so that it is ridiculous that one feels the need to mention it at all. This approach is certainly a feather in director John Krasinski’s cap as he goes about spinning this tale of a family who must navigate their lives in silence to avoid mysterious creatures that hunt by sound. Knowing that even the slightest whisper or footstep can bring death, Evelyn (Emily Blunt) and Lee (Krasinski) are determined to find a way to protect their children at all costs while they desperately search for a way to fight back. It’s probably clear to the reader that this reviewer has a fondness for the film, but it is necessary to point out some of the film’s aesthetic flourishes diminish its power. Slight adjustments could have been made to make the film even stronger, and these adjustments aren’t additions but are instead subtractions. The concept is simple: a predatory creature with sensitive hearing will eat those who make a sound. Therefore, the little sounds we make going through our day to day life should be the music of the film. This is a case where adding non-diegetic music actually reduced some of the film’s suspense. The choice of adding Marco Beltrami’s syrupy sentimental passages of music as the characters navigate their lives was at best unnecessary and at worst distractingly inappropriate. The film’s minimal sound design would have sufficed and the result would be a more eloquent and suspenseful experience. Concentrating on the minor noises that we create throughout our day would have also added the graceful poetry that the music is trying so desperately to force upon certain areas of the film. The strongest passages are those without music for this very reason. We will admit that some of the more suspense oriented music worked much better, but it is impossible not to wonder if the same thing could’ve been accomplished by using only the sounds of the creatures. Alfred Hitchcock used such a technique in The Birds (1963) to excellent effect as he planned the sound design as if it were a film score (even bringing Bernard Herrmann in as a consultant). Relying on music seems to fly in the face of the very concept that this story is built upon. The music was admittedly not as distracting after being acclimated to the unnecessary sentimental melodies (say maybe 20 minutes into it). There is a moment with the husband and wife dancing with earbuds in their ears, but we are not hearing the music. This was a beautiful moment until they brought the music into the soundtrack as she shared her earbud with him. The point of this seems to be, “I saw them do this on Garden State (2004) and it was really cool. I’ve always wanted to work it into a film.” It would’ve been lovely had they continued to play the scene against the silence. Such brave choices would’ve been true to the concept and added a poignant grace, but this is a film produced by Platinum Dunes and Michael Bay-esque (“boom, boom, boom”) sound design wins out in the end. The creature in A Quiet Place. In one of the Blu-ray’s supplemental features, they mention that the creature was originally planned to be less visible throughout the film but that they decided to feature them more overtly after falling in love with their design. Frankly, they should have stuck to their original intentions. The creature was too visible towards the latter part of the film. Quick moments of visibility would’ve worked better (and did work better in the film’s earlier scenes). I think that this only becomes more veracious when dealing with CGI creations since they aren’t organic. I’ll stop here, because these are simply minor blemishes on a very good creature thriller. It’s better than a lot of the horror films that have been released in the past few years. It’s a lot easier to pick apart a film once it has already been made than it is to make even a bad film—and I wouldn’t call this a bad film. Paramount protects their Blu-ray and DVD discs in a standard 2-disc Blu-ray case with film related artwork that blends an image from one of the foreign posters with a still in an obvious effort to include John Krasinski on the cover as if featuring him might result in more sales. That’s ridiculous and only disfigures the more simplistic foreign one sheet design (which was only “okay”). Why do marketing departments do this? It results in ugly artwork. This doesn’t come close to the worse we have seen but is still unnecessary and annoying. Happily, the case is protected by a slip sleeve. Unhappily, the slip sleeve features the same clumsy artwork featured on the insert sleeve. The disc’s static menu is reasonably attractive and intuitive to navigate. A Quiet Place was happily shot on 35mm but only received a 2K digital intermediate master (according to IMDb and other sources). Having not seen the 4K UltraHD disc, it is impossible to state as to whether it would be a major upgrade from this disc. However, it is relatively clear that it hasn’t been given a true 4K transfer and was instead up-scaled from 2K. One imagines that this would result in only a minimal upgrade from the Blu-ray disc. The Blu-ray, however, is beyond reproach and probably looks as good as it is going to unless they choose to rescan it in 4K at some point. There aren’t any compression issues to report, clarity is decent, color reproduction is very good with accurate flesh tones (at least within the context of the film’s aesthetic), shadow detail is even better, and the transfer showcases plenty of very crisp fine detail. It’s nice to witness a nice organic layer of light grain on a recent film for a change as the texture takes me back to horror’s glory days (even though I wasn’t really even round for those glory days). Frankly, this is an excellent transfer that is only limited by the production’s post-production workflow. Those purchasing the Blu-ray instead of the 4K release will have no real reason to bicker. Just in case the five-star rating doesn’t make the brilliance of this mix perfectly clear, be assured that your high end speaker systems will have a chance to shine. The Dolby Atmos track is superb and really places the viewer inside the film’s world, but it should be said that it is during the quieter sequences that the mix really shines. It’s all about contrast and small sounds that will place the viewer on edge. The sound design is without a doubt one of the film’s greatest strengths (even if it is too bad that the music sometimes gets in its way). Both tracks are tremendously dynamic while offering terrific clarity, perfectly rendered low frequency effects, clear dialogue (though this is rather sparse in a good way), and a sonic experience that represents this film perfectly. The separations are beautifully realized and the elements well prioritized. Just keep in mind that it is a good track for the subtleties of sound design and not bombastic activity. The materials in the three featurettes included on this disc would have made a more substantial “making of” documentary than what one expects from recent home video releases, but instead of editing them into a substantial program, Paramount separates the material into three less impressive “featurettes” so that they can market the disc as having three supplements instead of just the one. Never mind the fact that if they had included the theatrical trailers and simply included more material, they would have had something that they could market without actually disappointing those who shell out money for the disc. Oh well. While this “behind the scenes” glimpse includes more meaty material than we have come to expect from studio releases, each of the topics discussed could have been explored in more detail. This piece discusses the unusual concept, the genesis of the idea, the development of the project, and the cast in a very general way. It offers more than the typical EPK promotional fluff but lacks the depth that one once expected from their supplemental package. More detailed is this piece on the sound design and the score for the film. However, those who (like myself) felt that the sound design could have gone further than it did and not relied so heavily on music might get a headache from rolling their eyes. Don’t worry. This will pass. Special effects junkies will be pleased with this examination of the creature CGI that made it possible. At one point, the viewer learns that the filmmakers originally planned to show the creature less but fell in love with their final design and decided to show it more (or in more detail) in the final act. This was a mistake. It is too bad that they didn’t elaborate as to which scenes changed as a result and how these scenes were originally intended to play. This is a good example of the surface nature of the supplemental material. It never probes into the general statements that they make. It’s simply better than average. A Quiet Place earns its positive critical reputation but never quite reaches its own potential due to a timidity on the part of the filmmakers. It’s a good B+ movie that could’ve been an excellent A+ film had they trusted the audience a bit more than they did. Fans of the creature sub-genre will want to add this to their collection as it is the best they will have seen in a number of years. The Blu-ray transfer is technically very close to perfect and the supplemental package is better than one usually expects from studio releases. Obviously, this is a release that comes highly recommended. Notes: This title is also available in a ‘40th Anniversary’ UHD/Blu-ray edition. Both the Blu-ray/DVD and the UHD/Blu-ray versions include an Ultraviolet copy of the film. The disc covered in this review is the Blu-ray/DVD edition. It’s got a groove, it’s got a meaning… It’s difficult to imagine anyone needing a primer on Grease—which seems to enjoy the affectionate popularity of millions of viewers both young and old. Featuring an explosion of song and dance, as well as star-making performances from John Travolta and Olivia Newton-John, Grease made an indelible impact on popular culture. Everyone seems to know the film’s plot (and we use this term rather loosely in this particular instance), the characters, and (most importantly) the music. Boasting unforgettable songs including “Summer Nights,” “Greased Lightnin,” “Hopelessly Devoted To You,” “Look at Me, I’m Sandra Dee,” ” “Beauty School Drop Out,” “You’re the One That I Want,” and (of course) “Grease,” the film is a timeless feel-good celebration—but it is rather difficult to figure out the reason behind the film’s continued success. A subjective appraisal of the film will illuminate an excess of extremely obvious flaws that have been written about for the past 40 years. A review published in Entertainment Weekly at the time of the film’s 1998 theatrical revival read like a scathing diatribe and yet one senses that the reviewer had a grudging respect for the film. Roger Ebert’s review shared Schwarzbaum’s sentiments but still gave the film three out of four stars (which isn’t at all bad). “…No revival, however joyously promoted, can conceal the fact that this is just an average musical, pleasant and upbeat and plastic. The musical is being revived not because it is invaluable, but because it contains an invaluable cultural icon: the singing, dancing performance of John Travolta. Every negative remark written about this film is absolutely fair and usually on target, but for whatever reason, this reviewer is charmed to the core by its vitality and charm. It is good in the same way that The Rocky Horror Picture Show is good. Neither film is a sterling example of great filmmaking but they elicit an overwhelming amount of joy in the viewer if they are willing to submit their minds to their will. Actually, it might be said that the film is a “good film” since Grease was only ever meant to offer the viewer a few hours of mindless fun. Isn’t a film successful when it meets the filmmaker’s original intentions? This is a film that has been satisfying those intentions for 40 years! Paramount’s Blu-ray and DVD discs are housed inside an attractive Digi-book that looks like a Rydell High yearbook. Better yet, the plastic tray offers adequate protection to the discs (and a good many Digi-books don’t). The book contains several glossy pages of film-related photographs and artwork that adds some aesthetic value to the release (despite a very glaring typo). The animated Blu-ray menu features footage from the film and is accompanied by a snippet of “You’re the One that I Want.” It is an extremely attractive menu and is easy to navigate. Paramount worked with director Randal Kleiser to restore Grease to its original vibrancy with the highest quality sound, picture resolution, and color. The original negative was scanned and received extensive cleanup and color correction using previously unavailable digital restoration tools such as high dynamic range technology and the result is a marked improvement from earlier home video releases. The 2009 Blu-ray was acceptable but didn’t really live up the potential of the Blu-ray format. This new 40th Anniversary Edition improves on every aspect of the image—with an especially noticeable spike in fine detail. Colors are gorgeous throughout the duration, and black levels are perfectly within an acceptable range. There are a few shots that come across as soft, flat, and processed but these shots look this way on all of the various releases. This suggests that these issues are inherited from the source elements. It is reasonable to assume that this is very close to the absolute best this film can look. The transfer is nicely handled as well as there aren’t any nasty compression issues to annoy the viewer. The audio was enhanced from a six-track mix created for an original 70mm release, giving the music more clarity. There doesn’t seem to be an overwhelming difference between the audio transfer on this new release and the mix found on the 2009 disc, but the audio on that earlier release was serviceable and represented the original film adequately and this track follows suit. For a 5.1 Dolby TrueHD audio mix, the sonic experience isn’t terribly dynamic and might disappoint those hoping for an engulfing musical experience—even if the musical numbers are spaced out around various channels in a pleasing way. It is simply too front-heavy to really amaze the listener. One has the feeling that there were issues in the source audio that keeps the audio from being the perfect experience that fans are no doubt hoping to enjoy. However, it represents the source and this is all it really needs to accomplish. Most of the supplemental material has been carried over from previous releases and are therefore presented in standard definition, but there are three newer features that are blessed with 1080P transfers: Grease: A Chicago Story, Alternate Main Titles, and an Alternate Ending. Nothing on the disc really offers a comprehensive look at the making of this landmark film or any instructive insight into the reasons behind its continuing success, but the sum of all of these features do add up to more than the sum of their individual parts. It is simply too bad that Paramount hasn’t included the Grease Day USA television special that originally aired upon the film’s release (instead of merely presenting excerpts). While, it wouldn’t make for a very informative addition to the package, it an interesting look at the film’s marketing and release (with plenty of disco thrown in for good measure). It seems likely that they would’ve had to license some of the unrelated music in order to include the program in its entirety. Randal Kleiser and Patricia Birch may not offer a lot of revelatory information or analysis in their comments but they are able to offer quite a bit of fun trivia and details about the production while keeping the commentary interesting throughout the duration. Theirs isn’t the best commentary in the universe but it is far from the worst and is at very least a fun diversion for die-hard Grease fanatics. It’s impossible to understand why these introductions are even made for these home video releases. With the occasional rare exception, they bring absolutely nothing in the way of instructive information to the table. Kleiser’s introduction is not one of these exceptions and its inclusion here brings absolutely nothing of value to the disc. It merely takes up space. The original song is included here (in demo form) and is synced to the animated sequence as originally planned before Barry Gibb came up with its replacement. Frankly, it doesn’t work nearly as well—but this is what makes this one of the disc’s better features. It offers a real glimpse at the creation and evolution of the classic. What’s more, there is a contextual introduction offered at the beginning of the feature before playing the titles. This was very much appreciated. Again, it was a blessing in disguise that they were unable to use this alternate ending. The footage used here comes from the original black and white work-print of the film but has been shoddily colorized. In any case, it’s nice to have it here. It is nice to have the following deleted material in their black-and-white “work-print” form (even if there isn’t any noteworthy or substantial material that was left on the cutting room floor). ‘Grease’: A Chicago Story features new interviews with writer Jim Jacobs and original cast members of the Chicago show. It is probably the most substantial program included in the disc’s supplemental package and certainly the most informative. It covers how the original idea came about, and how the writing originated, the inspiration for location and characters, the collaborative process with Warren Casey, the original Chicago production, and even how it was discovered and became a successful Broadway show. This retrospective is an engaging look back at the film and its production and includes quite a bit of raw “behind the scenes” footage throughout its duration (which is really the featurette’s strongest attribute). Unfortunately, the interview content doesn’t probe into the production in any real depth and tends to lean towards the typical navel-gazing and generic complimentary phrases about the others involved. The participants really need to get out of PR-mode and offer real information about the production. There is no need to sell the film at this point. Grease was a massive hit, its decades later, and we own it on home video! However, it is still worth watching for the general information that we are actually given. One of the pleasant surprises on the disc is this coverage of the DVD Launch Party held in 2002. Frankly, one doesn’t expect very much from this feature. In fact, it doesn’t seem as if it will offer much of interest to the viewer in its first three minutes. It begins with an E! Entertainment-style montage of various cast and crew members (including John Travolta and Olivia-Newton-John) having their photographs taken and interview snippets that don’t provide any real insight into the film. These consist of statements like, “No one expected the film to be such a phenomenon.” However, this portion of the proceedings takes up less than three minutes of the duration. The rest of the program features three live concert performances with Olivia Newton-John, John Travolta, and other cast members. These include, “Hopelessly Devoted to You,” “You’re the One That I Want,” and “Summer Nights.” Olivia Newton-John carries these performances as her voice was the strongest after the many years that had passed since the film was originally released, but everyone seems as if they are having a blast and their enthusiasm is really quite charming. The dance numbers are briefly discussed in this featurette featuring Patricia Birch (choreographer), Bill Butler (director of photography), and Randal Kleiser (director). They discuss how the dance sequences were a collaboration that melded camera and dance and also reveal some extremely general information about how some of these dances were conceived and pulled off. I believe Olivia Newton-John makes an extremely brief appearance as well to comment on the film’s lengthy dance contest sequence. This short featurette isn’t terribly informative but may be of interest to vintage car and hot rod enthusiasts. The famous “Greased Lightning” car is discussed for a brief period and various people discuss their own vintage car projects. This dual interview finds both John Travolta and Olivia Newton-John at the DVD launch party in 2002 and the most interesting thing about this short clip is their rapport with one another. They seem like very close friends with a genuine affection for one another. The interview content is pure fluff and finds them talking generally about the film’s legacy. It’s not particularly instructive but it is kind of charming. Perhaps it is the archival nature of this interview with John Travolta more interesting. Taken from footage of the aforementioned Grease Day USA television special, the interview focuses on Travolta’s early career as a stage actor and his history performing Grease on stage (in a much smaller role). It isn’t nearly long enough to offer much in the way of substance, but what is included is worthwhile (if only as a time-capsule of the time the movie was released). As mentioned before, it is a shame that the entire program couldn’t have been included. Another clip from Grease Day USA finds Olivia Newton-John giving her impressions of the film’s reception and is more obviously publicity oriented than Travolta’s interview. However, it is really a very charming addition to the disc. Luckily, Paramount has seen fit to include the film’s original theatrical trailer on this release. It’s an interesting artifact that should please fans of the film. This feature offers fans the option of watching the musical numbers separately with the lyrics appearing on the bottom of the screen to create a karaoke video. One can also choose to watch the film in its entirety in this manner. The photos included on the disc are presented in slideshow form and organize into four galleries: Rydell High Year Book, Production, Premiere, and ‘Grease’ Day. You owe yourself a night of mindless fun, and this new 40th Anniversary Blu-ray will provide that in abundance! Posted: December 22, 2017 in mother! Note: This title includes DVD and Ultraviolet copies of the film. It is also available in the UHD format. Aronofsky isn’t this reviewer’s favorite filmmaker, but he is probably one of the most important and interesting directors currently practicing. Unfortunately, he is also one of the most pretentious. So, the question many critics were asking prior to viewing this film was simple: Is mother! Darren Aronofsky’s masterpiece, a piece of masturbatory self-indulgence, or a masturbatory masterpiece? There is quite a lot of debate about this, but most agree that the film is one of the most balls-to-the-wall insane cinematic experiences in recent memory. One thing is certain: If the film is a masterpiece, it is a self-indulgent one. There is no way that Joe Schmoe in the third row was considered for even the briefest instant while the script was being written. His allegory works best when it is contained in the realm of unusual but ultimately believable narrative. For example, the first half of the film is quite effective and incredibly bizarre without sacrificing narrative logic (even if it is a decidedly unusual brand of logic). This, however, changes in the second half of the film when Lawrence’s character becomes pregnant. It is as if the film starts all over again and this time, the rules of logic are abandoned completely and without rhyme or reason. Things happen that completely defy all logic as it nosedives into a surreal universe that doesn’t remotely resemble our own. Yes, this probably makes sense if one is watching the film purely as a symbolic/allegorical study, but Aronofsky begins the film as an unusual narrative and not merely a series of random symbolic events. The film could have easily worked on both levels. There are many possible readings for the film (all of them with obvious biblical origins), but this is a review and not an analytical essay. It’s impossible not to admire the thought and obvious intelligence that went into writing the film—and when the film works (as in the first half of the film), it is really quite extraordinary. However, neither the allegory nor the symbolism was particularly clever in the second half, because Aronofsky allowed the story that he had been telling to completely derail and it was replaced with an “on-the-nose” representation of the both the biblical elements that saturate his film and the destruction that man always brings to society and the world. It is no longer hidden in the interesting home invasion premise that he set up—and it could have been without sacrificing any of the chaotic intensity. What began as an interesting and wholly engaging experience ended in an uneven and wholly pretentious whimper of disillusioned disappointment. The disc is protected in a standard Blu-ray case with a shoddily cropped version of the film’s one-sheet artwork that omits everything that was provocative about that image and reduces it into a photo of Jennifer Lawrence’s face. The text is also cramped and poorly arranged. It’s pretty terrible. Why can’t studios simply use their one-sheet designs? They are almost always superior to the inept and often ugly images utilized for their home video releases. The case is further protected by a slip sleeve that features this same atrocious design. The film’s One Sheet artwork. The static menu design is much better and is elegant in its simplicity. It forgoes the usual musical accompaniment (for reasons that will be obvious once the viewer has seen the film). This transfer probably deserves five stars for representing the source materials in a faithful and efficient manner, but the score was bumped down half a point in order to address the simple fact that the source may be perceived as somewhat lackluster when compared to other contemporary films. The majority of mother! was shot on Super 16mm film (although small portions were shot on Red Epic Dragon cameras). The resulting image carries with it the limitations of the Super 16mm film format, which is considerably more limited than 35mm film and some of the better digital cinema cameras. However, this also gives the film a more filmic look that many cinephiles should appreciate. In any case the transfer itself really presents the film in the best possible manner. However this reviewer may feel about the film itself, it is impossible not to admire the terrific sound design. The included Atmos track perfectly represents the filmmaker’s intentions while offering the viewer a truly amazing sonic experience. The film is quiet throughout most of the duration, but there are subtleties in the mix that expand the film’s universe far beyond the frame. What’s more, the more dynamic sequences are spectacular and will really give those high end speaker systems a workout. Terrific. Those who enjoyed the film will certainly find this above average glimpse behind the making of the film. It isn’t a comprehensive examination of the film’s creation and it doesn’t offer an in-depth analysis of the material (which would have been quite welcome for a film of this kind). It merely showcases interesting behind the scenes footage with some very general comments from those involved. While a more in-depth study would have added enormous value to the disc, this small documentary is so much better than the usual EPK fluff that collectors have come to expect that one hates to complain. This extremely short featurette also manages to be something much more than the typical EPK drivel that appears on so many releases. We see behind the scenes footage as interview clips discuss the various make-up demands required for the production. Unfortunately—as the short duration might suggest—the information offered only skims the surface. The viewer isn’t given true insights as to how the effects were created. The terrific performances and solid direction simply aren’t sufficient reason to recommend the film to most viewers. However, Darren Aronofsky has plenty of disciples and they will want to kneel at his altar. Luckily, they will find that this Blu-ray of mother! is a more than adequate way for them to fulfill their needs. Notes: This film has had two previous Blu-ray releases and a number of DVD releases. This Platinum Anniversary Edition is essentially a re-packaging and does not represent any major overhaul. However, the advertised six “art cards” are exclusive to this set. “The Greatest Gift” originated as a short story by Philip Van Doren Stern, who famously gave the story to friends as a Christmas card when he couldn’t find a publisher for it, although it isn’t often mentioned that he found various publishers for it soon after it’s informal release. It was published first as a book and was later included in various magazines (sometimes re-titled “The Man Who Was Never Born”) The themes appealed to Frank Capra, who had built his reputation championing the “common man” and a “love thy neighbor” philosophy in his film work. The story seemed to encapsulate all of his favorite themes. Capra had already directed quite a few films that are undisputed classics, but none eclipse It’s A Wonderful Life—which stands strong as the director’s masterpiece. After being nominated for five Academy Awards (Best Picture, Best Director, Best Actor, Best Film Editing, and Best Sound Recording), the film passed into cinema limbo and was all but forgotten until television revived it many decades later. Worse yet, the FBI flagged It’s A Wonderful Life for what they perceived to be communist propaganda and most critics charged the film with being “saccharin.” Capra was known for his sentimentality. The press often labeled his films “Capra-corn” for this very reason. Perhaps the sentimental nature of the film’s ending overshadowed the film’s rather dark subject matter. George’s crisis is one that we all face. Responsibilities keep us from the lives we plan for ourselves. We watch our dreams move farther away from us on a daily basis, and the fact is that most of us never live the lives that originally hoped to live. The film’s fantasy elements make us forget that this is actually a very simple story about a man drowning in the realities of life. If the ending is sentimental, then the sentimentality has been well earned. Audiences recognize the honesty of George’s struggle. This is why they are able to accept and perhaps even embrace the film’s unlikely ending. Viewers rejoice when George Bailey’s friends bail him out of his predicament at the last minute. It reestablishes the themes of the film despite its sentimentality. Classics are classics for a reason and this film is no exception. It’s A Wonderful Life has landed on Blu-ray for the third time to celebrate the film’s 70th Anniversary, and the discs are housed in the standard Blu-ray casing with new film-related artwork that is reasonably attractive but not necessarily superior to the artwork featured on the first two Blu-ray editions. The case is protected by an embossed slipcover featuring the same artwork. Also included inside the case are 6 attractive “art cards” that feature various posters and lobby cards for the film. The inclusion of these cards is the primary difference between this new edition and the two previous Blu-ray releases. The menus are identical to those utilized for the previous two releases and feature a decorated Christmas tree. They are attractive and easy to navigate but one feels that they do not truly represent the film. My review of the earlier Blu-ray releases of this film was not only extremely forgiving but actually quite enthusiastic. Unfortunately, it is very difficult to be enthusiastic this time around, because Paramount wasted an opportunity to offer fans something even better than this transfer, which is the same one that they have offered twice before. The image is reasonably sharp and a marked improvement over DVD editions of the film and contrast is very nice indeed. Unfortunately, there seems to be some slight digital noise reduction on display. It isn’t quite as bad as some might suggest, but it certainly hasn’t been done as subtly as one might hope. Luckily, this is really the only issue that stands out. This Dolby Digital Mono mix is actually pretty decent, but why on earth wouldn’t Paramount take advantage of this new 70th Anniversary release and include a lossless audio upgrade? Could it possibly be anything other than laziness or apathy? Luckily, the track doesn’t contain the pops, hiss, and other distractions that one might expect from a vintage track. Dialogue is always clear and never distorted. Even Dimitri Tiomkin’s score sounds somewhat decent here. One cannot say for certain that a lossless track would be a marked improvement over this Dolby Digital transfer, but one would assume that such an upgrade might at least represent a marginal improvement. Before discussing the included supplementary material, it is necessary to point out that one of Paramount’s previous featurettes is conspicuously missing here (and from the other two Blu-ray releases. A Personal Remembrance is a fourteen-minute featurette with Frank Capra Jr. honoring his father and It’s a Wonderful Life. This wasn’t a very comprehensive featurette, but it did feature some interesting vintage interviews with Frank Capra and a short clip of James Stewart discussing the film. This feature was included on the more recent DVD releases of the film and is the only supplement not ported over for any of Paramount’s Blu-ray releases. While most (if not all) of the information covered on this absent featurette is covered in the Making of documentary included on the Blu-ray, it is still a little disappointing not to have it included in this so-called “new” Blu-ray package. The second disc in the set features a colorized version of the feature. I have never been a fan of colorization and prefer to see the film as it was originally intended to be seen. However, it is nice to have a good transfer of it included here because one never knows when a friend or relative will have a bias against black and white films. This version will at least allow these misguided people to enjoy the film (even if it is a mutilated version). The transfer certainly looks as good as can be expected. The transfer seems to be quite excellent with admirable detail. One cannot expect the colors to be natural because they simply aren’t. Purists will certainly wish to watch the original black and white version, which is more effective on almost every level. The made-for-television documentary about the making of this holiday classic contains quite a bit of interesting information and features retrospective interviews with director Frank Capra and James Stewart. This is certainly a very welcome addition to the disc even if it isn’t quite as comprehensive as it should have been. The original theatrical trailer is included here in high definition, and it is a nice little time capsule that offers fans of the film the opportunity to see how the film was marketed upon its release. It’s A Wonderful Life is much more than a beloved holiday classic. It is Frank Capra’s masterpiece and it should have a place in everyone’s Blu-ray collection. Having said this, there is absolutely no reason for anyone who owns one of Paramount’s two previous releases to double-dip unless the prospect of owning the six included art cards is too irresistible to pass up. Frankly, Paramount hasn’t taken proper advantage of the film’s 70th Anniversary edition. At the very least, they should have included a lossless audio transfer and the absent A Personal Remembrance featurette that graced DVD editions of the film. This featurette is conspicuously missing from all three Blu-ray releases (and at least one of these advertised that it would be included). Even the relatively nice image transfer probably could have been improved by an all new 4K transfer. However, those who haven’t already added this important classic to their collections should certainly indulge, because it doesn’t look like Paramount is going to spring for anything better than this. Notes: This release includes DVD and Ultraviolet copies of the film. A DVD only release is also available to own. Boyhood isn’t simply a remarkable film; it is a miracle on celluloid. Having recently won the Golden Globe for Best Drama Film, it isn’t terribly surprising that the film received as many as six Academy Award nominations (Best Picture, Best Director – Richard Linklater, Best Original Screenplay – Richard Linklater, Best Supporting Actor – Ethan Hawke, Best Supporting Actress – Patricia Arquette, and Best Film Editing – Sandra Adair). What Richard Linklater has accomplished with this film is nothing short of extraordinary. 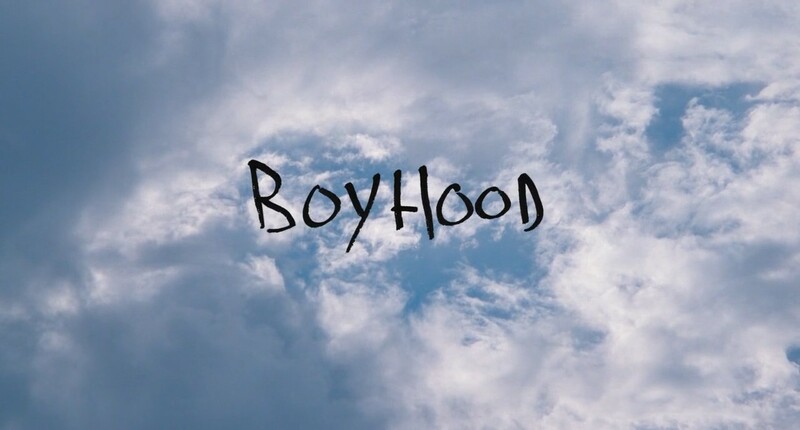 A few reviewers have noted a similarity with Michael Apted’s series of Up documentaries, but Boyhood is something very different. 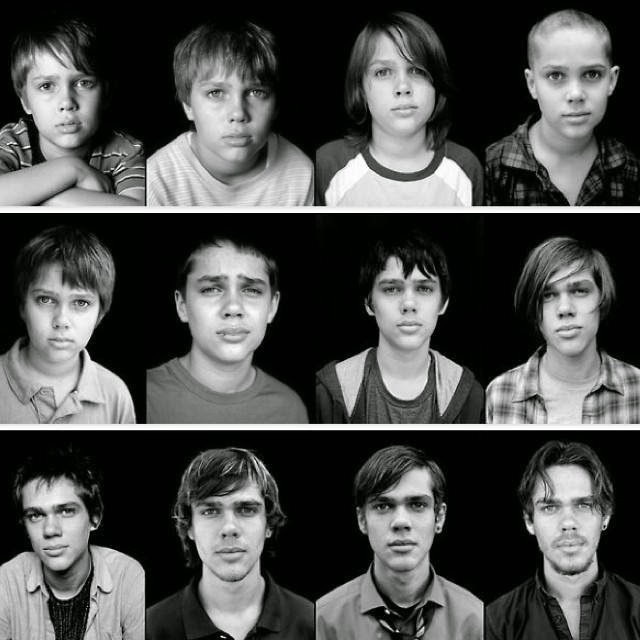 The cast of Boyhood had to commit to a film that would take twelve years to complete. Instead of writing a screenplay for his project, Linklater made a detailed outline of the major events that he wanted to occur. A short script was written every year for each individual shoot. This allowed Linklater to incorporate the personality of the actors into the film in an organic manner. Of course, there were many logistical headaches involved with a twelve year production model. The cast and crew would shoot for about three days every year during the twelve year period. This might sound easy, but each shoot required a lot of preparation. This allowed Linklater to edit the film in the same piecemeal fashion that the film was shot. The editing process could then inform what he would shoot the following year. It seems incredible that Linklater was able to find financing for such a project, and many studios passed without giving the project any real consideration. Fortunately, the director had worked on previous productions with IFC, and they agreed to finance the project. Their faith in the director has certainly paid off. Boyhood defies articulate description. It isn’t quite like anything that has preceded it, and yet it seems vaguely familiar. It is difficult to account for the familiarity. Are we somehow reliving something in our own lives through the characters on the screen? The answer to this question is impossible to answer. Those expecting the typical ‘coming of age’ melodrama might become irritated to some extent. Linklater shows the audience the small moments that make up a life. We are shown the little moments that people cherish in their mind, but that carry little to no importance to anyone besides the person who holds that particular memory. This is the film’s greatest achievement in many ways, because the viewer adopts these moments as he invests in the film. All of these things somehow become personal. We understand these little moments, even if they are different from our own memories. Somehow, we find ourselves adopting these moments (at least for the duration of the film). Perhaps this is due to the dreamlike nature of the film. One might think that Boyhood would be rather episodic (perhaps with chapter headings that indicate each year). Instead, the film flows without interruption like memories played out in a dream. It is a dream that I plan to have again and again. Paramount protects the disc in a standard Blu-ray case with film related artwork, and a slip sleeve with the same artwork protects the case. The disc’s animated menu is attractive and includes musical accompaniment. The filmmakers were able to maintain the continuity of the image’s texture throughout the twelve year production, and this 1080p AVC MPEG-4 encoded transfer accurately showcases this achievement. The 35mm source print must have remained in excellent condition; with only the occasional specks appearing towards the beginning of the film (none of these are distracting). There is a light layer of grain that one expects from any film shot on celluloid, and it is refreshing to see a film that looks like a film. Clarity is always excellent, and color is vivid while remaining natural. There are no discernable digital artifacts to distract the viewer either. Certain viewers will probably feel that the transfer is a bit soft. This seems to be the aesthetic of the film, and not an issue with the transfer. Black levels aren’t always precise, but few viewers will even register this flaw. It certainly isn’t distracting. Paramount’s lossless 5.1 DTS-HD Master Audio track should please viewers, but it certainly won’t give their sound system a workout. 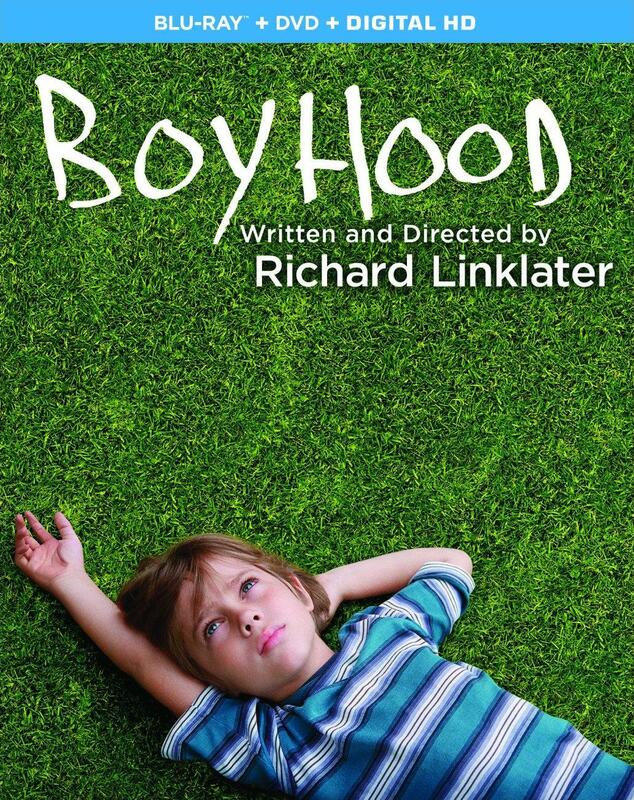 Boyhood is an epic drama, with a very simple sound design that is appropriate for the film. The track favors dialogue in a pleasing way, and is always focused clearly in the center speakers. Certain listeners may prefer that the music be mixed in a more immersive manner, but it was probably wise to keep the music focused at the front end. The track is always clear and well spaced. Ambience is always subtly distributed, and this keeps the viewer locked into Mason’s world. This program is from the post-screening Q&A with the director and cast held at Cinefamily in LA on June 15, 2014. The twelve year production is candidly discussed by the Linklater and his cast as they share interesting anecdotes, and other items of interest. At almost an hour in length, the viewer is given all sorts of interesting information. It is wonderful to have this included on the disc. This ‘behind the scenes’ featurette isn’t particularly comprehensive, but it is much better than the standard promotional EPK garbage usually included on more recent Blu-ray releases. Since the interviews are culled from throughout the 12 year production period, the viewer is given glimpses into the participants shifting perceptions about the production. Most aspects of the production are briefly covered here, and it is well worth nineteen minutes of the viewer’s time. Boyhood is essential viewing and will probably become a classic of American cinema. There were rumors that Criterion would release the film on Blu-ray, but Paramount would not play ball. It isn’t clear if the Criterion disc will ever happen, but it seems unlikely at this point. However, Paramount’s release should certainly satisfy most fans. It comes highly recommended.